What happens when the lights go out? Or when we venture out too late after dark? Perhaps we are camping and rise too early in the morning and are greeted with pitch blackness and the need to find something? How dark is the darkness when there is no glimpse of a rising sun and you are alone? Many of us have experienced darkness in our lives. Often we reach for the flashlight to relive our fears but before long we are banging it on our hand to get the last bit of power out before the light disappears. Surely we can relate this to our Christian walk. How many times do we reach for a temporary fix to our storm instead of allowing the Light of Christ to guide us? We think we can handle things on our own with our “man-made light” when in all reality it may work for a few moments and then fade away like the power in our flashlights. Faith in God will move us sometimes into unseen territory. He will take us where we never thought we could go and if it seems overwhelming we tend to take control ourselves not waiting for God’s light to finish leading us. We live in a NOW society. Nothing is fast enough for us and we lose sight of what God’s timing might be. For instance, I want a new home and every time God gives me a glimpse that He is working on it for me, I get excited and sometimes I try to take the situation into my own hands when in all realness I need to just step back and allow God to work in my situation! 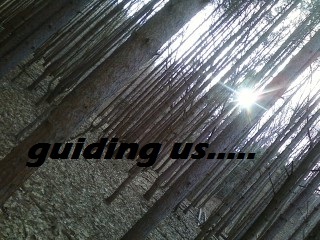 We need to follow AFTER the light before us and stay on the path, not go before it and let it follow us. Remember we are following AFTER Jesus, not leading Him. Sometimes the light will stop as we work out some issues and we need to be receptive to that stopping and just rest in Him, knowing He controls the light. If we get ahead of God, we get into trouble resulting in our own brokenness and distrust for the things of God. Yes, often we stray because we are not patient enough and I think God just sighs and waits for us to return. How dark does it have to get before we return? So lost in our storm we even begin to be at a loss as to where the light even is anymore. Have you been there? No hope for things to change just surrounded by darkness and feeling hopeless? I have been there a few times in my life and I am learning quickly it is better to just drop the flashlight I am holding and RUN towards the light and stay on the path before I fall away from the things of God. We grow weary without light in our lives, it is something we need to survive. God is our Provider and He gives us the Light of Christ so that we may dwell with Him. Why are we so eager to hold onto our own light when God’s light is everlasting and ours is only temporary? It is time to let go of our own selfish insecurity and DROP the flashlights! God has gone before us and prepared the way, all we have to do is follow and listen for His voice. Are you ready to let God have total control? Can you hear God calling you out of the darkness? What is hindering you from letting go of your own power source for light? Is it fear or unbelief? Do you not trust God because of some past hurts or regrets? Maybe you feel undeserving of such light in your life. I urge each of us to examine what our source is for light in our lives. Are we allowing God to shine on our path and lead us into victory over all the issues of our lives or are we clinging to our flashlights praying the batteries will last long enough to get us through the storm? Drop the flashlight and run towards the Light!! !